The Control Panel for a computer is essentially what it sounds like. It is the place on your computer from where you can control and change various settings. 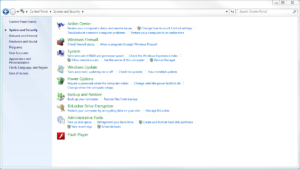 From the Control Panel, you have access to everything from computer’s security, to printers and other peripheral devices, and even setting when your computer goes to sleep, using the various options and sliders in the Control Panel. A note about this e-book: The instructions and screen shots you see here are shown for using the control panel on a PC computer with a Windows 7 operating system. 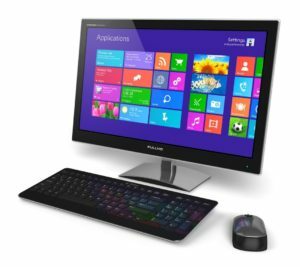 Accessing the Control Panel couldn’t be easier! First, click the start button in the bottom left hand corner of your screen. This is the button that has the Windows logo on it. This will bring up the Start Menu. 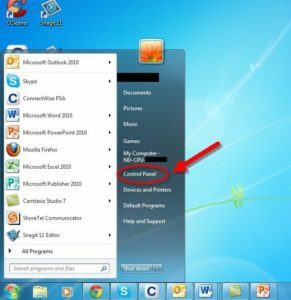 On the right hand side of the Start Menu, you will find a button for the Control Panel. Click the button, and you are in! So you’re in the Control Panel. Now what? 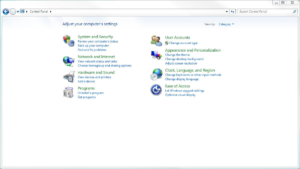 Once you have accessed the Control Panel, you will see various icons representing different categories of options available to you for changing settings on your computer. Let’s take these categories one at a time. 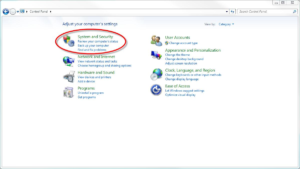 When you click on System and Security in the Control Panel, it will take you to a list of the different System and Security control settings for your computer. Many of these settings are difficult to understand, or potentially harmful to adjust if you aren’t a professional. However, some can be safely accessed and changed to suit your preferences. There are only four sections in this category that we are going to talk about. 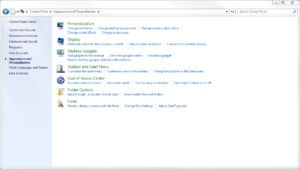 These are, Action Center, System, Power Options, and Administrative Tools. The rest of the sections are ones you want to steer clear of, as they should only be handled by IT professionals. 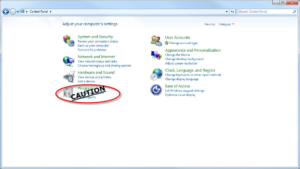 Making changes in any of the other sections could potentially cause irreparable damage to your computer. 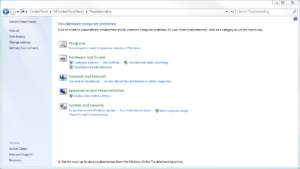 Under the Action Center, there is an option for “Troubleshoot Common Computer Problems”. 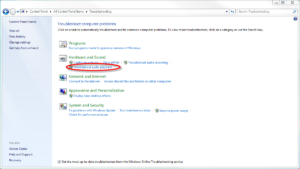 Clicking on this will take you to a list of automated troubleshooting assistance features. This is one section of the Control Panel that doesn’t involve making actual changes to your settings, but it is a good first step to try when something on your computer isn’t working. For example: If you are having trouble with audio playback on your computer, you could click on “Troubleshoot Audio Playback” under Hardware and Sound, click “Next”, and it will automatically detect and attempt to resolve any audio playback issues. Under the System section, the only links you should be concerned with are “View amount of RAM and processor speed” and “See the name of this computer”. 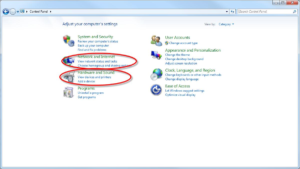 Clicking on either of these links will bring you to the same screen, called the Computer Information Screen. The Computer Information screen contains all of the system information for your computer, such as your computer name, amount of RAM, type of Operating System, etc. 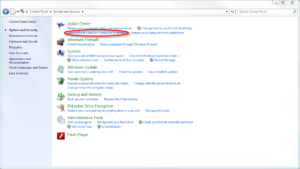 While there are no settings to adjust on this screen, the information contained here is invaluable to any technician who is trying to work on your computer. Pro-Tip: If your Operating System is new enough, you can use the keyboard command “Windows Key + Pause/Break Key” to instantly access the Computer Information screen. 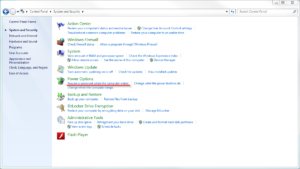 The Power Options section has a lot of settings available to you that can be safely changed. However, while pressing buttons and moving sliders is fun, if you change the power settings without knowing exactly what effect they will have, you could cause your machine to begin acting erratically. 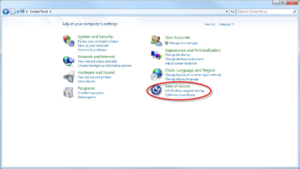 One example of an options available to you in this section is the ability to set a password that will be required when your computer wakes up from the “Sleep” state. To do this, click on the link “Require a password when the computer wakes”. This will take you to a screen where you can control what happens when the power button on your computer is pressed, and when the sleep button on your keyboard is pressed (if you have such a button on your keyboard). 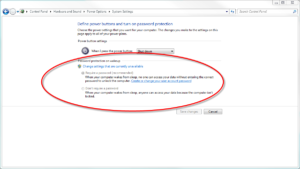 Below those options, there is a section to choose whether or not you would like to enable password protection on wakeup. 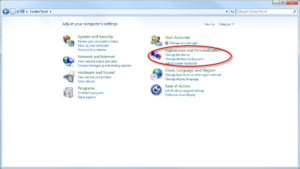 If you choose to require a password, which is recommended, there is a link to “Create or change your user account password.” Chances are, you already have a user account password, which is the password you use to log into your computer. 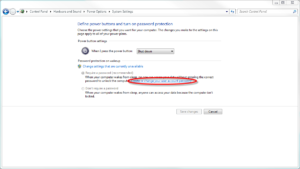 So, if you want password protection on wakeup, all you have to do is make sure that it is enabled. In the Administrative Tools section, there are only two things that are of any use to you (unless you happen to be an administrator). 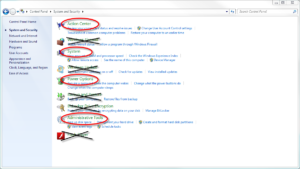 The first one is the Disk Cleanup Tool, which will help you free up space on your computer. To access it, click on the “Free up disk space” link. This will bring up a list of files it detected that are good candidates for deletion. You can pick and choose which files you would like to get rid of. 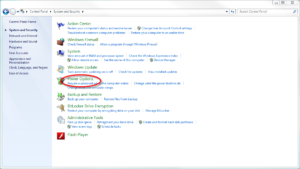 For a more detailed look at the Disk Cleanup Tool, you can read this blog post. 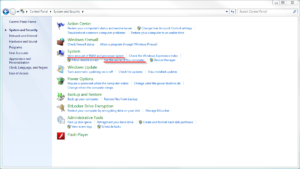 The other tool that might be of some use in this section is the Disk Defragmenter, which is another way to clean up space on your computer and improve performance. 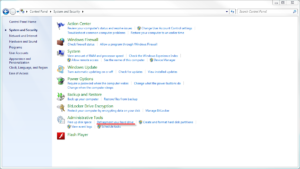 To use this, click the “Defragment your hard drive” link, and choose the hard drive you want to defragment. A note of caution regarding disk defragmentation: Defragmenting your hard drive can take a VERY long time, and use a large amount of system resources. 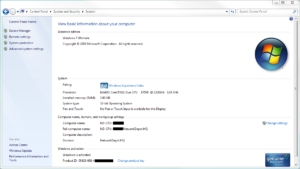 So, unless you have a long period of time available that you don’t need to use your computer, you should not run the Disk Defragmenter tool. 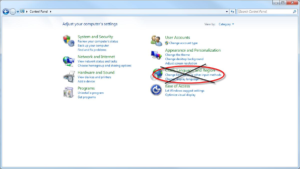 Unless you are an Administrator, there are no settings in these categories that you should change without first consulting your IT professional. 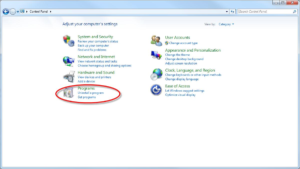 If you ever need to uninstall a program, this is where you would go to do it. However, you should NEVER uninstall a program without being absolutely sure what it is. 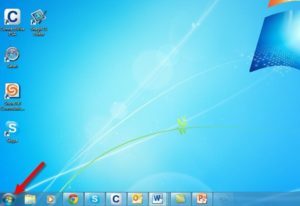 If you uninstall a program without understanding its purpose, you might render one or more other programs on your computer unusable, as programs can depend on one another to work. If you want to delete programs to free up space on your computer, it is a best practice to consult your IT professional before doing so. 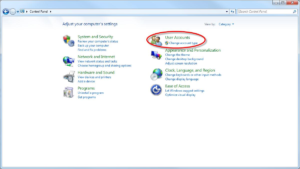 If you are an Administrator, this is the section of the Control Panel that you would use to add users, delete users, and manage user settings. 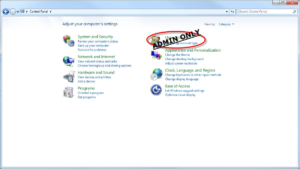 If you are not an administrator, you probably don’t have access to this section anyway, so you don’t need to worry about it. Oh, the joys of Appearance and Personalization! If you enjoy color coordinating, this is the section for you. Here, you can do anything from changing your background to customizing your sound effects. If you have the time, feel free to go into this section and go nuts! There is only one section here that you should avoid, and that is folder options. Making changes here could have adverse effects on your system’s stability, so it is best just to steer clear. Unless you are an administrator, there will never be a reason for you to access this section of the Control Panel. If you see that you system’s time, date, language, or region is incorrect, contact your IT professional, as it might be a sign of a bigger problem. 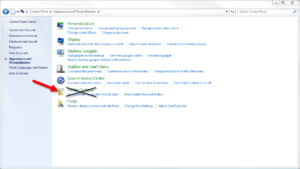 If you are visually or hearing impaired, this section of the Control Panel offers options to improve your Windows experience. One example of how the Ease of Access section can help a hearing impaired user is by replacing sounds with flashing notifications. 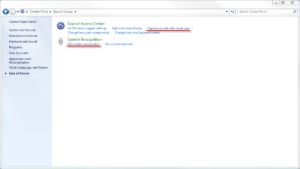 For a visually impaired user, Speech Recognition can be enabled, allowing the user to control their computer with voice commands. As you can see, the Control Panel has many different layers and functions. It is the place on your computer to go to fix problems, get information, and customize your machine. Have fun exploring all the wonders the Control Panel offers, but use caution. If you change something that was not supposed to be changed you could end up causing severe permanent damage to your machine. If you are interested in learning more about what you can do with the Control Panel, feel free to reach out to us. We are always happy to answer any questions. When in doubt, call before you click!